Manchester United unveiled Everton striker Wayne Rooney as their biggest signing of 2004 just before the transfer window was due to close in August. The Red Devils signed the 18-year-old in a deal that could eventually be worth £30million. Rooney signed a six-year contract and Everton will receive 25 per cent of any transfer fee if he leaves Old Trafford. Contingent payments, dependent on club success, the player renewing his contract and his appearances at international level, could see the transfer fee rise to almost £30million. Manchester United beat off competition from Newcastle United for Rooney's signature. A naturally gifted striker, Rooney scored 15 goals in 67 Premiership appearances for Everton since making his debut for the club in August 2002 in the 2-2 draw with Southampton. The teenager's record for England is outstanding - his excellent Euro 2004 displays brought his tally to nine goals in just 17 appearances for his country. It was these performances which really instigated the bidding war between United and Newcastle for the teenager's signature. But Rooney chosing of United was vindicated by a superb debut season at Old Trafford. Since his move he has flourished under the close guidence of Sir Alex Ferguson who has an excellent track record with youngsters. In his debut - a baptism of fire in a Champions League group game against the tough to beat Fenerbahce - he scored a sensational hat-trick as United went on to trounce their Tukish opponents 6-2. Since then he continued his fine form. He added 14 further goals (including a vollyed wonder-strike in United 2-1 home win against Newcastle) to his tally and has clocked up 43 appearances, justifying his high price tag. He was an undoutbed highlight in United's otherwise lacklustre season. He was also named the PFA Young Player of the Year beating off stern competition from Jermain Defoe, Arjen Robben, Cristiano Ronaldo, Stewart Downing and Shaun Wright-Phillips. However, he sometimes let his tempremental nature get the better of him. His frequent on-field swearing encouraged the English Schools' Football Association (ESFA) to drop him from a guest appearance claiming he was "not a good role model". 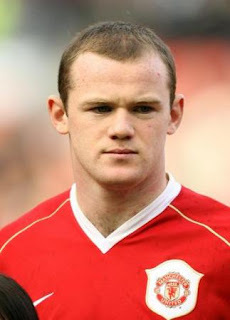 FIFA president Sepp Blatter made further comment, saying that Rooney needed "a clip round the ear". Rooney's antics off the pitch did little to dispel these criticisms when a student accused him of assaulting him in a Manchester club. Rooney denied this and was later vindicated as the claim was dropped. As his second season for Manchester United emerges the only thing, it seems, that can stop Rooney is if the media interest surrounding him and celebrity girlfriend Coleen McCloughlin distracts him from his football. He continued to impress in the 2005/06 season for United, often seeming like the only thing keeping them going in some tricky spells, and was rewarded with his first major medal in the Carling Cup final, where he scored twice against Wigan and received the Man of the Match award. However, his season ended in heartbreak as he suffered a metatarsal injury against Chelsea, putting his hopes of playing in the World Cup in jeopardy. He did manage to recover in time, though he probably wished he hadn't bothered, as he was forced to play up front on his own, failed to score and was sent off against Portugal. A dubious pre-season red card lead to Rooney having to serve a three-match ban early on in the 2006/07 campaign and it took him some time to regain his match fitness and sharpness after such a chaotic time. However, when he did come into form his goals played a hugely important role in winning his first ever Premiership title. This fine form continued in 2007/08 as he once again scored a handful of vital goals to steer United to Premier League and Champions League glory.